TOLLI glue-laminated timber is an essential part of Finnish building construction. The durable glued structure withstands the demanding conditions imposed by Finland’s hot and humid summers and by the freezing days of winter. TOLLI glue-laminated timber is used and praised by several highly renowned house manufacturers. It is guaranteed to last in the final product. Beautiful and lasting terraces and other yard structures, along with safe wooden structures that meet the demanding requirements of playgrounds, are constructed from TOLLI glue-laminated timber that can withstand harsh weather conditions. 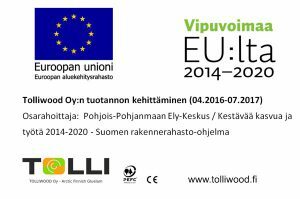 Tolliwood Oy also produces extra-dry glue-laminated timber for step plates, rails, and furniture billets.